On 2017’s International Women’s Day, around fifty individuals gathered at the Old Treasury Building in Melbourne to participate in The 100% Project’s celebration. The event centered around a panel discussion, with a group of highly accomplished individuals discussing their experiences in making gender headway here in Australia. Sarah Davies, CEO of Philanthropy Australia. Drawing upon their own personal and professional lives, the panel shared insights into how they’ve recognised the barriers preventing equal representation in the workforce. Their insights were further encouraged by contributions from the audience, delivered through real-time messaging of questions for the group to discuss. The panel discussed practices that encourage diversity, from recognising privilege to the different yet equally powerful capabilities of introverts, and a review of recruitment processes can help towards working for a more diverse, inclusive workplace culture. Another key theme throughout the night was on the characteristics of a good leader. Women are often told to be more assertive at work; however, the panel arrived to similar conclusions of leadership being an activity, and to avoid attributing characteristics to a certain gender. Men also struggle with stereotyping, which can make it challenging for them to adopt carer roles at home. So while we are in the process of creating more opportunities for women at work, the discussion also noted the need to involve men in the conversation on workplace initiatives. The night was a celebration of the many accomplishments made possible by the women’s rights movement. However, it was also an opportunity to reflect on the next steps to improve the state of leadership in Australia, for both sexes. The next The 100% Project event will be held in Brisbane Apr 20th, to review the Men@Work research report and various gender equity programs that can help to improve the adoption of flexible work policies for women and men. In 2015, there were more men named Peter leading ASX200 companies, than there were women in those positions. An unpublished analysis by workforce diversity specialist Conrad Liveris revealed the shocking and unfortunate truth of the leadership landscape in the modern age. Oracle’s HR trends for 2017 report identified transparency into workforce diversity as a key area for the coming area. HR leaders may have been paying attention to these metrics for years, but as more research surfaces on the business case for a more diverse workforce, it might be time for the rest of the corporate world to pay attention. For example, McKinsey Global Institute found economic opportunities to be in the trillions with greater gender equality, and a number of studies speak to the organisational impact of a broader workforce. After all, most companies are smart enough to know you need some representation to truly understand and deliver to your customer base. The value in diversity is not surprising. How could this possibly be a bad thing when women have gone above and beyond to prove our capabilities? More women are graduating with tertiary qualifications than men. Part-time workers, made up of more working mothers than men, have proven to be the most productive in the workforce. At the broader end of the funnel, women are kicking goals. This is further demonstrated in the overall numbers, where there is a lot less of a disparity in the younger workforce. Women represent a good chunk of the working population, and unsurprisingly, begin to filter out as we get older. This is not old news – the numbers tell us that women take up most household responsibilities and family related obligations that extend far beyond maternity leave. It’s more likely to mean that we need part-time or flexible working options to be able to manage both personal and professional lives. Combine these needs with the stigma behind flexible policies, and it’s no wonder why the demographic becomes more ‘uniform’ the higher up the ranks we go. What can we do to keep equality going? These types of observations are exactly what spurred the founding of The 100% Project – a group focused on achieving gender equality at work. The 100% Project combines research, events and consultations to explore (and help implement) workplace practices that improve representation at work. Bringing a unique touch to the space, The 100% Project also explores practices that assist men in achieving a more positive working experience through the Men@Work series. Studies in this series have dissected the barriers that prevent men from participating in flexible working policies, and positioned its adoption in ways that are easily digestible by businesses. Address the barriers that prevent both women and men from participating fully at work. The 100% Project recognises that equality at work is a team effort, and are always looking for new recruits to champion the cause. Find out more at http://the100percentproject.com.au/. If you’ve landed on this article, then there is a good chance that you’re interested in improving diversity and representation at your organisation. You might feel passionately about the cause, recognise the benefits, and are raring to see more people like you up the ranks. Yet, we’re still finding that the upper echelons of the professional world are still heavily skewed; the C-suites make up of mainly men. To get us a step closer to resolving this problem, the management consultants over at Dattner Grant hosted #hesaidshesaid16 in Melbourne on 19 October 2016, an event that helped to challenge the traditional ideas of a leader through the format of an interactive workshop. Attendees learned from the experiences of experts, and were prompted to actively challenge our biases throughout the session. The panel of 7 ranged from various industries, including law, human resources, marketing, and manufacturing. While there were more women than men in attendance, it was a better ratio than some of the other events advocating equality that I’ve attended. Participants were invited to bring a younger person to raise the ratio. It certainly was an event that walked the talk. Clearly keen on practical outcomes, Fabian Dattner – one of the founders of Dattner Grant – gave consistent reminders across the course to focus on the actionable, and to check our biases. This was particularly handy for me, an individual contributor who is knees-deep in diversity but works in an environment that’s 90% male: it would be far less effective for me if the talk had been purely on quotas, which we’ve heard plenty about. Track other measures: Flexible working is disruptive to the traditional idea of a good employee – long hours in the office are no more! But with any well-established notion, absence from the office may impact key performance indicators that are deep-rooted in these ideas. Start tracking other measures, such as your average best to close deals, to bring into your next meeting to prove that flexible hours are a workable way of the future. Take responsibility for the cause: In a frank summary of the point, we can’t blame men for being men. But the higher up the ranks we go, we build our networks and might be in a better position to teach and mentor younger cohorts. Exercise the opportunity to teach younger men how to work with women and challenge what is currently acceptable behaviour, such as the assumption that women are aggressive when they are assertive. Mind your language: When speaking in a group of men, be firm, and be clear on what you’re trying to say to get your message across – this was the advice from Steven Leighton, Executive General Manager at the Dulux Group, in response to the question of whether women need to change the way we communicate. And while this was packaged to address a gendered issue, I think it makes good business sense to just have a purpose when speaking. Support women: I enjoyed the honesty of the forum, and was comforted by the fact that a lot of women struggle with the confidence to progress at work in the same way that I do. We discussed the statistic that women only apply for a job when they are 100% sure, while men will go for it at 60%. To tear this apart, start by encouraging a woman in your workplace to take up a challenge that you think they might be capable of. A small step like this one can help break down years of conditioning. Call it: Have you ever found yourself in a situation where you recognised sexism but wasn’t sure how to respond tactfully yet effectively? Well, fret not, because the room responded with resounding support when an attendee posed the question to panelist Jennifer White, HR Director at Avnet Technology Solutions. Her response? Inject some humour and address it. The mixed panel agreed this would be uncomfortable, but best to call it out especially if the sexism transpired unconsciously. At the end of the workshop, the panelists were asked about their wishes following the event. In my opinion, the most powerful response came from Jennifer, who advised that we’re all capable of doing something with the gender imbalance, independent of how far along the corporate ladder we are. I went into the session struggling with the concept of wanting to advocate for equality while juggling my relationships in a male-dominant workplace – these takeaways gave me a good starting point which I’ve started to implement from day dot, and I hope the list will help you too. Scott Butterworth, Acting CRO of Product, Markets, and Support Units at NAB. The panel sought to discuss the concept of flexible working, and its application to the broader workforce. The discourse looked to explore certain questions, including 1) What do men think about their roles, at work and at home? ; 2) is work-life balance an ideal that only women want? ; and 3) how is unconscious bias preventing equality initiatives? Typically, discussions on flexible working are made with the working mother in mind. Without a doubt, it is challenging to juggle the demands of parenthood while holding down a career. However, the whole entity of parenthood is often eclipsed by the traditional notion that domestic responsibilities are women’s issues; after all, ‘parents’ should include dads too. A 2013 report published by The 100% Project revealed the finding that men are wanting to make a larger contribution to their families and the community, but are bound to the constraints of traditional working hours. And while flexible working has become more achievable recently with the adoption of new technology, its acceptance has been met with some resistance – on some level, due to unconscious bias. In the past ten years, we’ve seen a significant uptick in the term ‘unconscious bias’, which refers to ‘implicit attitudes that we are unaware of’. It’s a term that most in this space would have uttered themselves, but as is the nature of the bias, it takes deeper reflection to recognize those that we still possess. Scott Butterworth recently conceptualised this in an anecdote, where he recalled leaving work early to fetch his children from school, and doing so in a hushed manner. It took a concentrated effort to march back into the office, and to walk behind the talk of workplace flexibility for all. And why shouldn’t be this case? Will Irving noted that the best performers need their rest too, using the example of athletes. In today’s workplace, most of us expect ourselves to be on-call 24/7, forgetting that this is a marathon – not a sprint. To be effective and to thrive is to evolve with the times, and we can’t be attached to work for longer hours without striking a balance elsewhere. While the panel recognises that some drawbacks may include the initial outlay, including costs, setting of boundaries, and changes in management styles, these are the prices they would justify paying for the return of improved employee engagement and consequently, productivity and positivity. With accessible, modern capabilities on hand to make flexible working policies an achievable reality, simply saying ‘no’ is no longer an option for most organisations. Indeed, it is likely to be less challenging to consider solutions which enable adoption, instead of finding reasons behind why flexible working policies shouldn’t be adopted, especially when observed benefits include greater retention of talent and overall better business results. With these benefits in mind, flexible policies could assist a myriad of employees in managing work with other life goals and responsibilities, thus making for a more inclusive and diverse workforce. And while inclusivity in itself is a powerful reason, studies extending as far as decades ago have found that diverse working groups create positive outcomes, as seen in the likes of Barney’s 2001 study, ‘Resource-based theories of competitive advantage: A ten-year retrospective study on the resource-based view’, and McKinsey & Company’s 2007 report. In organisations where men have taken up flexible work options, we have seen some of those rates triple in just a couple of years. Those same organisations have also reported greater employee engagement and productivity, which have been attributed to the practice of flexible working. So when we have organisation-wide adoption of a policy producing tangible business benefits, it becomes harder for companies of today to resist flexible working. The future of work will be different from what it is today, something which is indicated by globalisation and new capabilities in technology. Flexible working will in future be a significant factor behind attracting and retaining talent, maintaining productivity levels, and painting a positive employer brand. Forward-thinking organisations would be best to explore adoption now, because it seems that everyone wants flexible working. My office has a child care centre right next door so there are always parents and children coming and going at various times of the day. The busiest time of course is first thing in the morning. Today I noticed something I consider significant – there were more men (I assume Dads) taking children to the child care centre than women! I don’t know why I only noticed it today, because it is unlikely that this situation occurred overnight, but I couldn’t contain my pleasure and smiled broadly! The 100% Project delivered a report on 27th June in Sydney (coming up on 2nd August in Melbourne) about Men at Work and how the majority of them fear asking for flexible work at the risk of not being seen as dedicated to their careers. Although my experience this morning doesn’t necessarily mean that Dads are asking for flexible working options, but I believe it does demonstrate that they are becoming more involved with caring for their children. A step in the right direction! A colleague of mine recently said that we need to “deconstruct masculinity and what it means to be a man”. What I have taken from that stirring comment is that the stereo-typical male image still lingers even though their involvement in family and community is changing. Let’s stop thinking about the man as the primary breadwinner, working long hours and at arms-length from family commitments. Even more than that, men should be allowed to frame their own family and community lives without having to live to others’ perception of what their roles should be. What did eBrands learn from the Men@Work research commissioned by The 100% Project? Kevin A Moore, Chairman of eBrands, has written about his learnings from our Men@Work research event in Sydney Jul 2016. eBrands was one of our generous sponsors for this event. We were in the audience of a little under 100 execs, consultants and journalists at KPMG in Sydney last month. And the panel and interaction with the audience was animated, and the content very revenant to eBrands 17 year history. There isn’t an Employee Value Proposition (EVP) brief we work on that doesn’t have “diversity” and ”flexibility” within the body of the document. And there isn’t a solution we provide that doesn’t have both of these employee needs “tangibly” at the heart of the EVP solution we build with our client. I use the words” needs”, “tangible” and “solution” deliberately. Why? Well for several reasons. No manner of engaging, innovative, and compelling imagery or copy has ever truly brought an EVP to life. The tangible manifestation of the benefits of working for one organisation in preference to working for another is what comes from all good research, strategizing, solution shaping and creative delivery. It’s the tangible feeling of working alongside and interacting with a truly diverse team that is palpable. The freedom and productivity from experiencing a truly flexible work environment that harnesses technology, shares tasks with others and helps the real world environment through less travel time in traffic is rewarding for employees. These are the tangible and flexible bits. The “solution” element is that each of these different elements in the employee offering needs to be tailored to each individuals needs based on their life stage needs regardless, not because of their gender. A carer is carer, and their time, flexibility and carer needs are the same irrespective of gender. Whether caring for children, partners or extended family. However, the big challenge for leaders in organisations is to tangibly evidence that they believe this to be true, and evidence it in their actions. A male CXO very visibly arriving late or leaving early to spend time with children is a clear diversity message. A female CXO very visibly arriving late or leaving early to coach a sporting team is too. Most importantly is that the message in their actions is to ALL employees in the workplace. The panel at the 100% Project “Men at Work” session varied in industry career path, ethnicity, gender and in the countries they’d worked in. Execs from KPMG, CBA, Google, to name just three. However, all agreed that to truly create a diverse working environment, all men and women had to be convinced through their leaders’ actions that could both have the same access to flexibility without any negative impact on their careers. Will you help us in important research about the opinions of gender quotas in Australia? The 100% Project, in conjunction with Deakin University, is conducting research to further investigate the nature of support for gender quotas for senior leadership roles in Australia. This study will contribute to the growing body of research about gender quotas and their implementation in the Australian context as a means of redressing gender balance in senior leadership roles. The 100% Project is a not-for-profit organisation that aims to address the gender imbalance in leadership opportunities in the Australian workplace. Our mission is to challenge organisational leaders to change the practices and mindsets within their organisations to fully realise the leadership potential of women and men. This study forms part of The 100% Project’s research effort within the Australian context. Your participation involves completing an online questionnaire, which will take approximately 20 minutes in total. You will receive clear instructions before the study and an explanation at the end. To participate you must be over the age of 18 and currently working in Australia. Participation in this study is completely voluntary and anonymous. A Plain Language Statement is attached to this email which outlines the study and contains important information for participants. Please read this before consenting to and commencing the study. A report of aggregated results will be available on The 100% Project’s website when the study has been completed. If you have any work colleagues, family or friends that would also be interested in helping us with these research, we ask you to please forward this link on to them. ASX 200 companies, which since 2012 have been subject to diversity guidelines, are reporting significantly higher performance than other companies against diversity measures, new research shows. The Workplace Gender Equality Agency report, based on data from 255 reports of ASX 200 companies and 4,415 reports of non-ASX 200 companies, shows 52.6 per cent of ASX 200 organisations analysed the pay gap in the last 12 months compared to just 17.2 per cent of those not in the ASX 200. 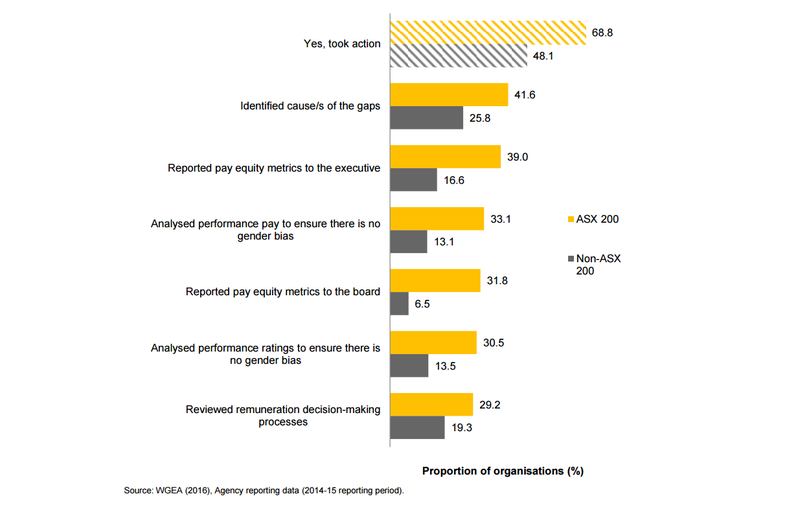 Some 68.8 per cent of ASX 200 employers have at some time analysed and taken action to address their gap, the report shows, with the most common step being identifying the cause of the gap (41.6%), reporting pay equity metrics to the executive (39%), and analysing performance pay to ensure no gender bias is present (33.1%). While nearly a third (31.8%) of ASX 200 companies report pay equity metrics to their board, fewer than one in 10 (6.5%) non-ASX 200 organisations do. Men in ASX 200 organisations earn on average 28.7 per cent more total remuneration than women, while those in non-ASX 200 companies earn on average 22.7 per cent more, the report says. The ASX 200 has a higher proportion of employers offering a flexible work policy or strategy (74.3% compared to 59.4%). For both groups, the three most common forms of formal conditions and practices are carers’ leave, part-time work and unpaid leave, and the three most common informal conditions and practices are time-in-lieu, flexible work hours and telecommuting. The WGEA says in the report that ASX 200 organisations should focus on increasing the amount of paid primary and secondary carers leave and support for employees experiencing domestic violence, and continue to address pay inequality and the limited representation of women in leadership positions. Australia’s two-speed economy is creating mixed demand for HR professionals, according to a new employment market update. Chandler Macleod says in its HR update that the “turbulent economy”, low business confidence and rapidly changing technology has impacted the HR job market, but pressure for greater cost efficiencies is increasing demand for generalists and candidates with process automation expertise. Diversity remains a “hot topic” nationally, so related experience and achievements are also considered valuable, and professionals with change management, workforce planning and IR experience are increasingly sought after, it says. 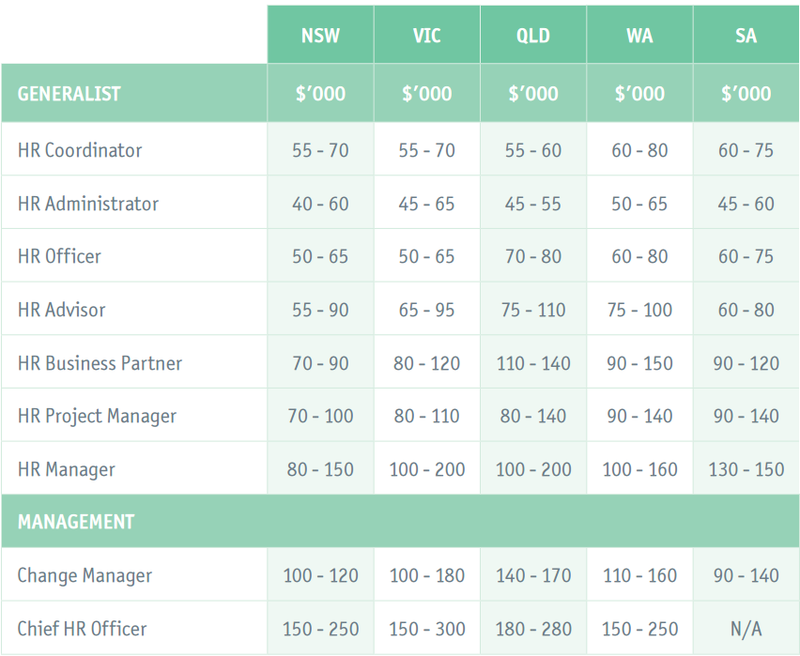 In NSW, demand for HR professionals is weak, though HR and change managers and organisational consultants are sought as employers re-configure their workforces to reduce costs. 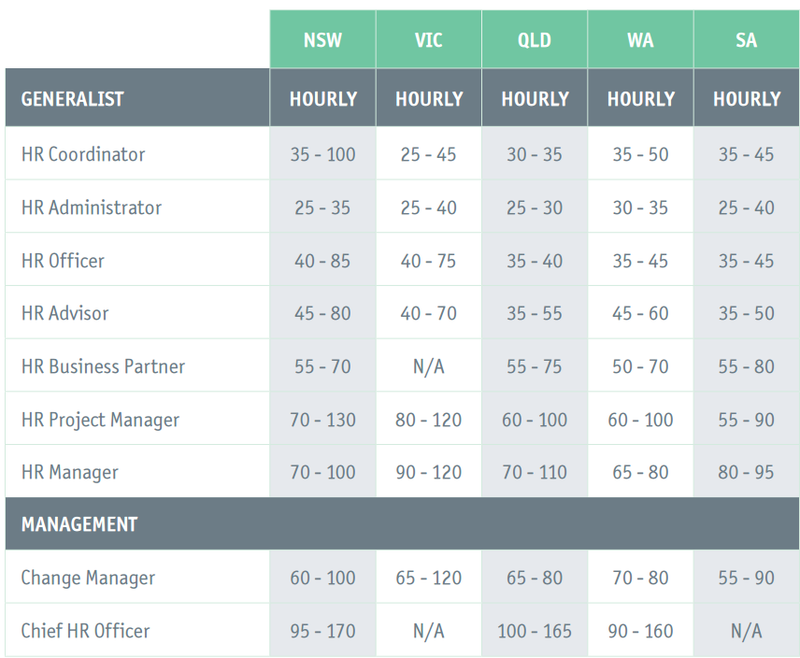 The HR job market in Victoria is steady, the update shows, particularly for generalists and quality health and safety candidates; while in Queensland, steady job growth has increased demand for organisational development and change specialists, and for health and safety candidates in both white- and blue-collar sectors. Western Australia’s “subdued” labour market is expected to increase demand for flexible, local and multi-skilled workforces, while South Australia’s high unemployment rate means talent is readily available across most sectors. South Australia is also seeing among large organisations a trend of advertising HR roles internally, while sourcing talent for temporary roles externally. Candidates looking for permanent roles should therefore consider temporary roles, “as a way to gain access to internally advertised permanent opportunities”, the update says. Employers should ensure they’re aware of several changes to employment law that came into effect on 1 July, says Coleman Greig principal Stephen Booth. First, the new minimum wage is $672.70 per week (up from $656.90), and all award pay rates have increased by 2.4 per cent. Employers should beware of paying less than the national minimum wage to any employee not covered by any age or disability-related percentage rate, he notes. As previously reported, the salary cap for unfair dismissals has increased (up from $136,700 to $138,900), as has the compensation limit ($69,450, up from $68,350). Further, employers with more than 20 employees should now be complying with the SuperStream system (simplified electronic superannuation compliance), while organisations with fewer than 20 employees now have until 28 October to comply; and the Fair Work Commission has updated the information statementthat must be given to all new employees. One in four organisations across Asia Pacific have “few” HR and talent management metrics, which are mainly focused on employee outputs, new research shows. Commissioned by Workday, the IDC research involved more than 1,400 employees and managers across Asia Pacific, finding that while most employers measure “basic workflow and functionalities”, just seven per cent of organisations have integrated HR platforms that align to business needs and provide a “holistic view” of employees. This is a key finding, according to the researchers, as these employers tend to be “the most mature… when it comes to their workforce management capabilities”. To adequately measure employee performance, organisations should track recruitment, compensation, talent management, payroll and learning, they say, and focus on analysing employee retention and payroll costs. Organisational output and employee morale improves when the talent of male and female employees is harnessed equally, but how do you improve the ratio of female employees and managers, and how do you achieve equal pay across your workforce? “Similar to setting financial or other operational targets, establishing realistic gender diversity targets based on rigorous analysis and baseline data will help to ensure an organisation treats equal gender representation as a central business issue and puts in place the strategies and resources to meet the targets.” The Workplace Gender Equality Agency, Targets and Quotas, 2016. Targets are voluntarily set by the company, which means they are able to be designed and tailored as realistic goals for each department, within the whole company, and as is appropriate for the relevant industry. Setting a low target will not drive change, while setting unrealistic goals will damage morale and cause employees to give up before the challenge has even started. Set realistic targets, design implementable policies and support your employees to take up the challenge. As progress is made or unforeseen consequences arise, targets can be massaged to reflect realistic and ongoing goals. However, the leadership must be honest in its objectives and challenge the prevailing culture, and if a milestone is not met, the leadership should not look for an easy excuse – otherwise, why set a target in the first place. Examine why the failure occurred and continue to challenge the organisation. Demonstrate to your employees that the leadership does not give up. Because targets are set by the individual company, the leadership and its employees are likely to buy into the idea, support new policies that are implemented to achieve the target, and gain a sense of satisfaction when the target or milestones are reached. This in turn increases the likelihood that targets will be achieved. Setting targets is a part of everyday business. Employees and management understand targets are potent weapons and are familiar with strategies and policy changes to shape performance. This familiarity with the vernacular means there is less likely to be resistance to a new concept. Targets require the design and implementation of policy across all hierarchical levels of an organisation making their achievement more likely to be felt throughout the company. A gender diversity target should not just be implemented in one area, for example, accounting middle management, as the effect on the organisation as a whole would be minimal. Rather, gender diversity targets should be designed and set for each area and level to achieve a noticeable change. By implementing targets, businesses may be forced to discover talent and ideas they would not otherwise have considered, thus improving their business. Targeting equal opportunities for both genders in the workplace will also improve the retention of talented women. A final tip: Make your organisation’s targets public. Your business is more likely to achieve targets that are publicised because not only will the public be able to hold the leadership and business to account, but current and potential employees, clients and competitors will too. Gain the edge, be progressive and be an employer and partner of choice. Contact The 100% Project for strategies to move forward on gender diversity at your organisation. We like to think Australia is the land of the ‘fair go.’ But a recent report from the Workplace Gender Equality Agency suggests all is not fair in Australian business. According to the Workplace Gender Equality Agency (WGEA) Report ‘International Gender Equality Statistics’ of May 2016, Australia has the 6th worst average gender pay gap of 22 OECD nations with available data (the OECD totals 34 countries), with a gender pay gap of 18%. The gender pay gap is the difference between women’s and men’s average weekly full-time equivalent earnings, expressed as a percentage of men’s earnings. The average was 15.3% and the best performer was Hungary with a gap of only 3.8%. Representation of females on the boards of Australia’s largest publicly listed companies was average at 19% (using 2014 data). It follows that 81% of board members across the largest Australian businesses identify as male, an overwhelming majority. The WGEA also reported that only 12.3% of women in business are board members which is below the OECD average and quite a low figure considering Australia’s high rate of female workforce participation at 70.5%. But the future does look brighter for women in business. Australia led the field in the proportion of females in the workforce who are managers at 8.9% (male managers were at 13.3%, the second highest proportion behind Estonia). Other OECD nations had a closer male to female ratio but Australia still had the highest proportion females in management. It follows that these women will have a greater chance of advancing to board roles in the future than those of other OECD countries, simply because there are more of them. Additionally, Australia ranked fourth for attainment of Bachelor’s degrees, with 26.1% of women attaining a Bachelor degree or equivalent, higher than the number of men at 21.4%. This trend was reflected across the OECD. One could speculate part of the reason for women attaining a tertiary qualification at a higher rate than men is because males are more likely to be involved in fields such as construction, agriculture, mining and manufacturing – trades in which leaving school and taking up an apprenticeship to learn a skilled trade might be preferable. It is notable that women are sorely in the minority in these fields. Currently, only 21.9% of ASX 200 directorships are held by women. With more women moving into management roles combined with government and corporate efforts to change the culture of gender inequality in big business, the women achieving a tertiary degree or equivalent today will have a better chance of advancement and fulfilling their potential throughout their careers. As more women with more qualifications move up the corporate ladder, it is up to them and their male colleagues to change workplace culture so that there is equality between men and women. At The 100% Project, we provide businesses advice on how to promote and implement gender equality policies in the workplace, so be a part of the change and ask us for advice. We’re only a click away!